Here on the high plains of Wyoming, our summers are cool and dry. We rarely need cooling, but when we do, we can just use fans and passive ventilation. Not everyone has a simple option, however. Each greenhouse and farm has its own advantages and set of needs. Like with any decision, each cooling method has its limits and tradeoffs that growers must balance; a method might work very well but impose a limitation elsewhere. This doesn’t mean that the method is not worth using, but growers who are aware of those tradeoffs will run healthier, more productive greenhouses. The first method recommended for greenhouse managers is shade cloth. Shade cloth or shade curtains are quite affordable and can lower temperatures by up to 10 degrees. The tradeoff that managers will have to balance with shade cloth is between lowering temperatures and losing some production with the light that is being blocked. You can get shade cloth at Greenhouse Megastore. Depending on the level of humidity you have in your area, evaporative cooling can be a good cost-effective method for you. You can buy the pads for a cooling wall online through Greenhouse Megastore, and make your own wall with some PVC, 2X4’s and a small sump tank. Learn how to make a cooling wall in this video. Circulating fans are a must for any grower to keep air moving for gas exchange and temperature consistency. In greenhouses, circulating fans help push warm air out and cool air down. There are a few other ways to cool a greenhouse, such as geothermal heating and chillers. We’ve found, however, that the cost of buying and running equipment associated with those methods are far too high to be effective in most situations. As with other management goals, start with the practices with low labor and financial costs. Strategically ventilating the greenhouse and keeping certain components underground, for example, can contribute to cooling, and they cost very little. Remember that cooling needs vary based on location, orientation, and greenhouse type! Think about how air is already moving in and around your farm, how your farm is shaded or insulated, and work with it. Need training for growing in a greenhouse? 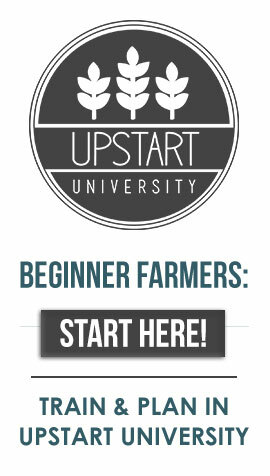 Upstart University is the place for you! Learn at your pace in online courses on topics from business management to growing with hydroponics. Register today for $9.99/month, or $99 for a whole year of access to Upstart University! Aquaponics Vs. Hydroponics: Which is Better? Sunken or earth sheltered greenhouses are another, more historic, option that moderate both heat and cold. Both options require digging, which can be pricey, but may be worth it in the long term. Is not shade a plus in very high solar radiation areas? Around here, the Salt Lake valley, I know Summer is officially upon us when the sun feels like it will rip the flesh off my bones. I don’t get the same feeling when I am at lower and more humid altitudes (I got a bad sunburn visiting family in Turlock, California because the sun felt so benign compared to home. Many of my plants go dormant in July and August, but start setting again in September, leaving a lot of green fruit with the first frost. The main reason I want to put in a hoop house or greenhouse is to extend the season and give more predictability to the harvest. I am also hoping that the glazing or film will diffuse the harsh summer sun and promote summer growth and productivity. Does high humidity bring in pathogens as you state or are they already in the air and the conditions just allows then to develop? Hi David – Humidity both encourages pathogens (like fungal pathogens) and affects how water flows through plants (for example, making it difficult for the plant to transpire). Both of these impact plant function and growth. This ‘small’ town has a Latitude of -37.6795 and a Longitude of 144.57 . I write because I have have read some of your answers to how to Heat/Cool your greenhouse and I found them very informative. I hope you can (and don’t mind) answering my question. My green house is approx. 10 yds X 5yds .I am in the process of Glazing the walls and doors.It has a skillion roof which is made of corregated ‘plastic’. I am presently installing a couple of horizontally directed fans at ground level directed across the width of the structure. My question to you is how do I deal with high heat/humidity in Summer and Low heat /Humidity in winter. I grow Cacti, succulents and caudiciforms. It looks like the climate is pretty mild there so, in winter, solar sinks can be a great passive heating system and may be all that is needed as low temperatures only reach the mid-40s. Small heaters can also be added as well as ensuring the greenhouse is well sealed. Humidity can be increased in winter by misting/fogging systems. In summer, heat can easily be managed by shade cloths and properly sided ventilation fans to remove the hot and humid air. Always glad to see more information out there about greenhousing strategies! Can’t wait for the seminar next week! Glad to hear it, Marisa! There’s some great practical and how-to type information in the webinar, so we’re excited to share it! The vertical farms of the future will be a complex set of mutually supporting systems. They will grow food, medicines, ornamentals, and plants that support their enclosed ecological system biota. Operating with passive solar design for the most part, active systems will cool and dehumidify using heat pumps across adiabatic walls. Hot water and essentially distilled water will be a useful products resulting from this heat transfer and capture. They will be visually interesting from an architectural perspective because of their multistoried platform design, glazing materials, and the LED lighting that allows controlling the degree/heat/days required for plant maturation. Permaculture gardens will surround the base of many of these simplified yet complex structures (reduced complications while simplifying necessary complexity to most workable form). Heike, thanks for the heads up! That link has been repaired now. Hi, what can you recommend in cooling an already open greenhouse like the one in picture #3?.. there is only 1 kind of shade cloth in my area(50%) and it tends to reduce PAR greatly causing my plants being leggy. cooling pad and circulation fan are for sealed greenhouses so i think they wont help. any suggestion? Neil, if you have the option to close the greenhouse it’s worth considering – evaporative cooling isn’t too effective unless you can control airflow. If the temperatures aren’t too high, you might be able to get away with just ventilation but I’d consider something with more control. If you send me some pictures and more info at amy@brightagrotech.com I’ll try to get you some more specific information. What greenhouse is recommended for a hot tropical Island? Hi Homar, this depends a lot on zoning and your budget, but we’ve been pretty happy with hoop houses. Be sure to choose something with adequate cooling (or that you can get an HVAC system for). Months. Humidity is a problem and disease that goes with it. In area where it doesn’t work financially, to heat and cool even if we build a passive solar. Is this true? I would like to ask here whether the earth air tunnel (EAT) can be used as an active alternative cooling method for cooling the greenhouses? Yes, however, we recommend looking into the GAHT (Grount to Air Heat Transfer) systems. They work on the same principle. Just found this forum. Im in Texas so you know I got a HOT HOT Greenhouse. Just put a soaker hose on the roof …. turned it on real slow and watched the temperature drop from 106 -to 95 in ten minutes! I thought since i have well water (free) this is to good to be true. ANy downside I’m not thinking about? Well water may potentially contain minerals which can cause buildup on the greenhouse glazing. If so, this buildup will limit light transmission into the greenhouse. It might be more effective to utilize a misting/fogging system within the greenhouse for cooling. In addition, wet wall systems are very effective for cooling but generally cost more than foggers. Hello! I am thinking of turning our empty-never-filled concrete pool (it has been unfinished for nearly 20 years) into a subterranean greenhouse. The climate here is basically desert with seasonal humidity (Red Sea, Egypt), with constant temperatures near 40 C in the summer and as low as 10 C in the (short) winter months. What do you think would work best for passive/low-maintenance cooling and ventilation year round? Shade cloths, wet walls or swamp coolers, and standard ventilation fans are probably the best methods for low maintenance. Check out “The Year-Round Solar Greenhouse,” a book that has some good information on heating and cooling. Just ordered a fixed wall green house 8 x 20 dbl wall polycarbonate with windows front back and sides and a dutch door. I ordered an aluminet 80% shade cloth. Would a green cloth under the aluminet provide any advantage. I want to keep the temp down. Im new to this, I dont have a fan just yet. What can I do to be able to use this in the summer its here in Oklahoma and hot. I will have side shade from a row of trees when they leaf out each year.